Vascular development is studied in several model vertebrate embryos, with different species having distinct advantages for understanding various aspects of vascular morphogenesis. Avian embryos of the chicken and Japanese quail have the advantage of accessibility in the egg or whole embryo culture, quail/chick chimeras, and a monoclonal antibody (QH-1) that labels quail angioblasts and endothelial cells. Mouse embryos from a variety of transgenic and knockout lines have been examined for vascular patterning defects, leading to the discovery of unexpected roles for several genes. Frog embryos have the advantage of ease of injection of DNA constructs for overexpression and classic tissue transplantation studies. Zebrafish embryos are nearly transparent, allowing for easy observation of the developing vasculature, and large-scale genetic screens have identified mutants with vascular pattern formation defects. Figure 1 Initial Steps in Dorsal Aorta Morphogenesis. Embryonic blood vessels form from angioblasts that originate from the embryonic mesoderm by epithelial to mesenchymal transformation (EMT). (A) Two cells in a simple cuboidal epithelium acquire gene expression changes (shaded) that distinguish them as angioblasts. (B) These two angioblasts undergo EMT. (C) The angioblasts migrate and cohere to one another. (D) Two angioblasts have formed a portion of a solid cord. In the case of the dorsal aorta, a thin cord runs in the cranial-to-caudal direction. (E) A lumen is formed between two endothelial cells that continue to adhere at their junctions. (F) A sprout has formed off the vessel with the formed lumen. 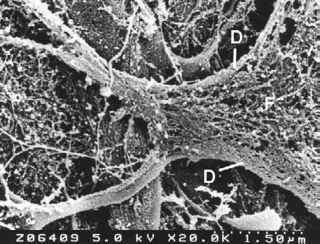 is morphogenesis of the intersomitic arteries that sprout from the dorsal aorta (Figure 1F) after a lumen has formed.